Plum Island Coffee Roasters is a local specialty coffee house located in the center of a working boatyard. Plum Island coffee Roasters roasts, serves, and sells specialty coffee beans from around the world. At Plum Island coffee Roasters we strive to make sure that our coffee is the freshest it can possibly be. We roast all of our coffee in small 50 lb batches, which allows the roast master to have incredible quality control and adds artisan flare to our coffee. All our coffee is roasted fresh every week and shipped to us the same day that it is roasted ensuring that our coffee is ultra fresh. We strive to provide our customers with great coffee, friendly service, and a relaxing and comfortable atmosphere. 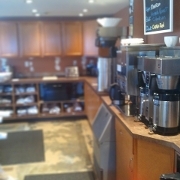 We serve a variety of cafe beverages and always have a light, bold and decaf drip coffee on tap.